Showing items in category Singapore, sorted by newest listed first. 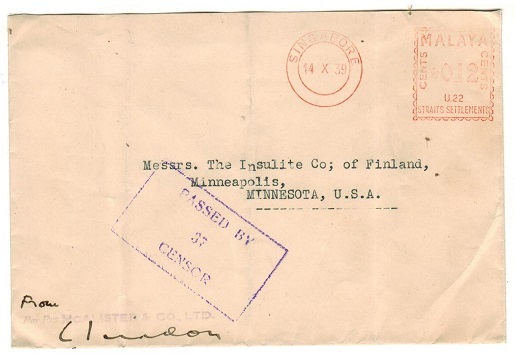 SINGAPORE - 1939 0.12c red meter mark censored cover to USA. 1939 (14.X.) stampless cover addressed to USA (three vertical folds) cancelled by an early strike of the red MALAYA/0.12/CENTS/U.22/STRAITS SETTLEMENTS meter mark of SINGAPORE and struck by violet boxed PASSED BY/37/CENSOR handstamp at lower left. SINGAPORE - 1954 $100 IMPERFORATE PROOF in claret and blue of the REVENUE issue. 1954 $100 IMPERFORATE PROOF printed in claret and blue of the REVENUE issue on gummed paper (cut close at left) and with dark gum strip of reverse. Taken from the 'Colour Control Sheet'. A rare piece from the printers archive. 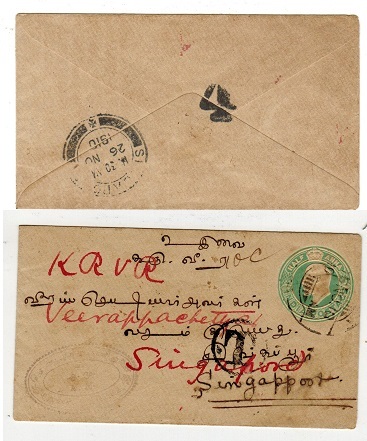 SINGAPORE - 1915 4c rate 'PASSED BY CENSOR' cover to India. 1915 (JY.10.) cover addressed to India bearing Straits Settlements 1c green block of four on reverse cancelled SINGAPORE with cream censor strip at top and struck on front by violet crowned PASSED BY CENSOR h/s. 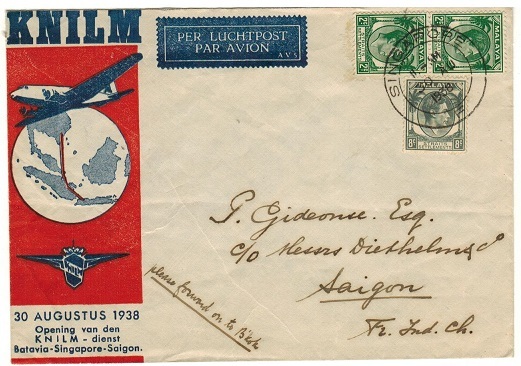 SINGAPORE - 1938 'KNILM' first flight cover to Saigon. 1938 (AU.30.) 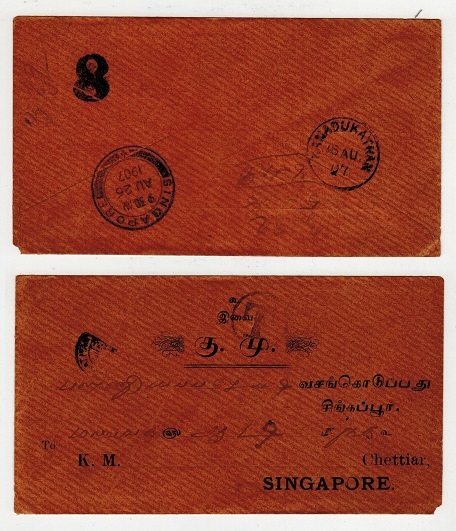 use of illustrated 'KNILM' first flight envelope addressed to Saigon bearing Straits Settlements 2c pair and 8c adhesives tied SINGAPORE. Batavia to Saigon route via Singapore. SINGAPORE - 1935 4c brown-orange PSE of Straits Settlements to UK uprated. H&G 3. 1935 4c brown orange on cream postal stationery (a little overall toned) envelope addressed to UK bearing 4c orange adhesive tied by SINGAPORE d/r cds. H&G 3. 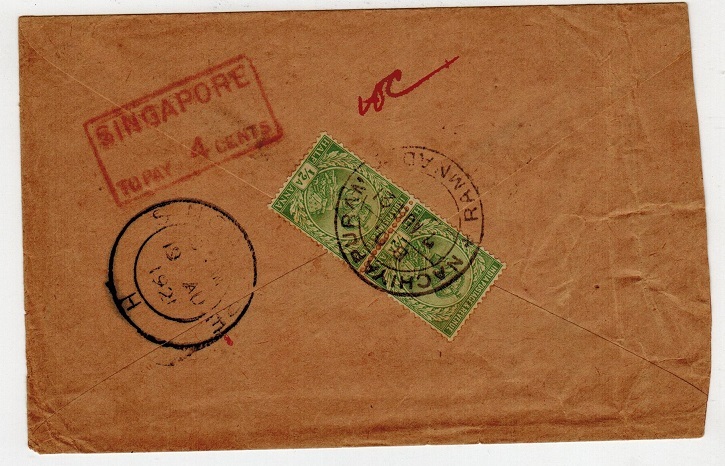 SINGAPORE - 1930 inward underpaid cover with Straits 2c and 4c 'Postage Dues' added. SINGAPORE - 1940 (circa) 2d 'LIQUIDATION OF EMPIRE' forgery. 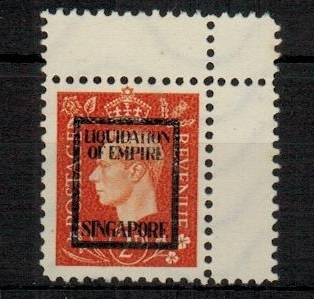 1940 (circa) 2d orange 'GB' adhesive (forged) overprinted LIQUIDATION/OF EMPIRE/SINGAPORE. 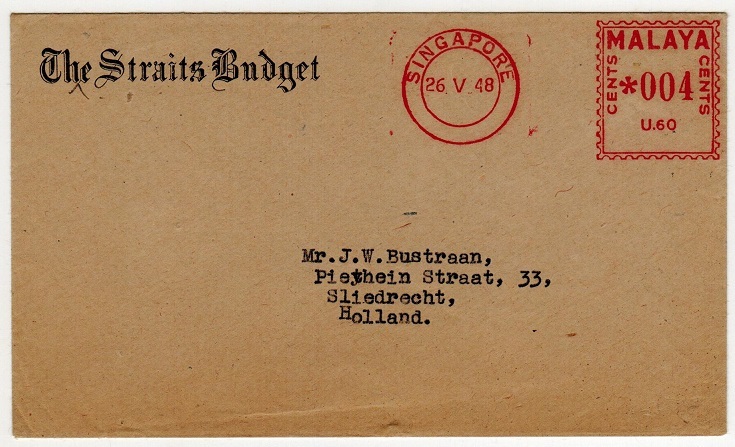 SINGAPORE - 1946 'OAS' cover to Holland used at NETHERLANDS POST OFFICE/SINGAPORE. 1946 (FEB.9.) 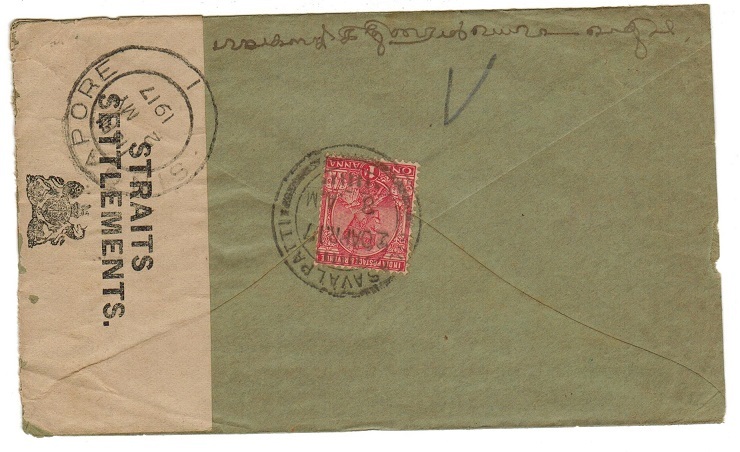 stampless cover addressed to Holland marked 'On Active Service' and cancelled by scarce violet NETHERLANDS POST OFFICE/SINGAPORE. Dutch troops stationed in Singapore. SINGAPORE - 1904 inward postcard from UK with 'PENANG TO SINGAPORE' marine sorter cds applied. 1904 inward postcard from Niton on the Isle of Wight via Ventnor addressed to the 1st Battalion Manchester Regiment based in Singapore with neat PENANG TO SINGAPORE marine sorter cds applied dated MY.14.1904. Proud type L.
SINGAPORE - 1937 use of TELEGRAM form. 1937 (AU.30.) 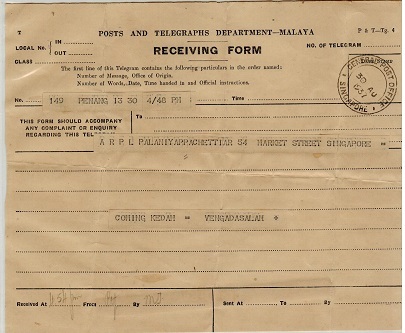 use of (P & T -Tg4) POSTS AND TELEGRAPHS DEPARTMENT-MALAYA RECEIVING FORM cancelled GENERAL POST OFFICE/SINGAPORE. 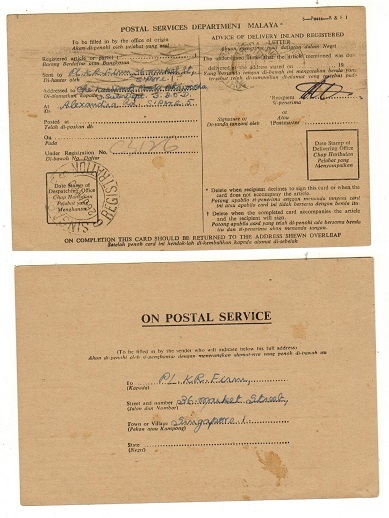 SINGAPORE - 1941 'CABLE AND WIRELESS' telegram form complete with original envelope. 1941 (DEC.13.) 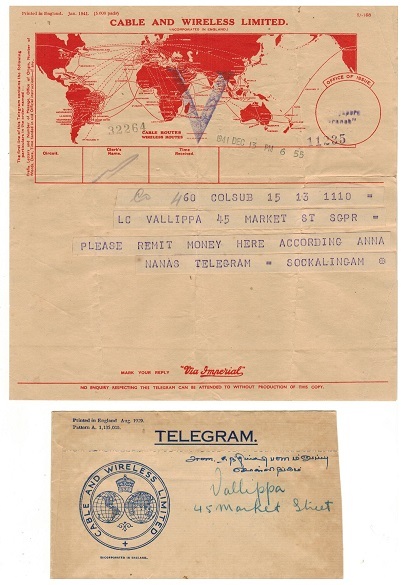 red on buff CABLE AND WIRELESS LIMITED telegram form struck 'V' for Victory complete with original envelope. 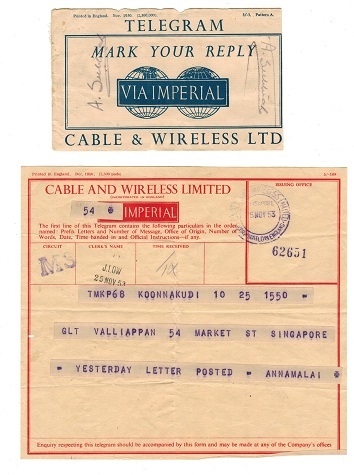 SINGAPORE - 1961 'CABLE AND WIRELESS' telegram form complete with original envelope. 1961 (NO.16.) red on buff CABLE AND WIRELESS LIMITED telegram form cancelled by CABLE AND WIRELESS/SINGAPORE/INCORPORATED IN ENGLAND cds complete with original telegram envelope. 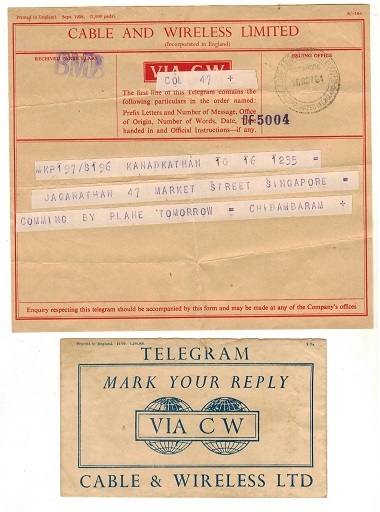 SINGAPORE - 1947 'Cable and Wireless' TELEGRAM form used. 1947 (MAY.31.) use of red on cream CABLE AND WIRELESS telegram form cancelled by violet oval CABLE AND WIRELESS LIMITED/SINGAPORE handstamp. SINGAPORE - 1960 use of ON POSTAL SERVICE-ADVICE OF DELIVERY postcard. 1960 (JAN.26.) use of black on manilla POSTAL SERVICES DEPARTMENT MALAYA 'Advice Of Delivery' postal stationery postcard headed ON POSTAL SERVICE addressed locally and cancelled SINGAPORE/REGISTRATION/6. 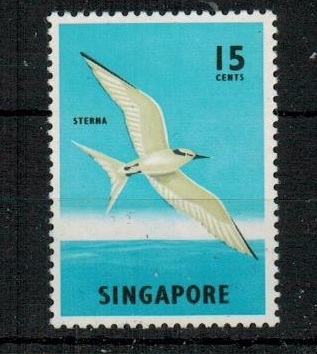 SINGAPORE - 1962 15c 'tern' adhesive U/M with MISSING ORANGE variety. SG 70ab. 1962 15c 'Black Naped Tern' adhesive in fine unmounted mint condition showing the variety MISSING ORANGE (eye). SG 70ab. SINGAPORE - 1941 censored first flight cover to USA. 1941 (MY.18.) first flight cover addressed to California cacheted at lower left with commemorative handstamp. Bears Straits Settlements 5c,40c and $1 adhesives tied SINGAPORE/DON’T WRITE ABOUT SHIPS slogan strike and with violet triangular PASSED FOR TRANSMISSION/95 censor mark. Morenweiser type 6C. SINGAPORE - 1941 censored first flight cover to Guam. 1941 (MY.18.) 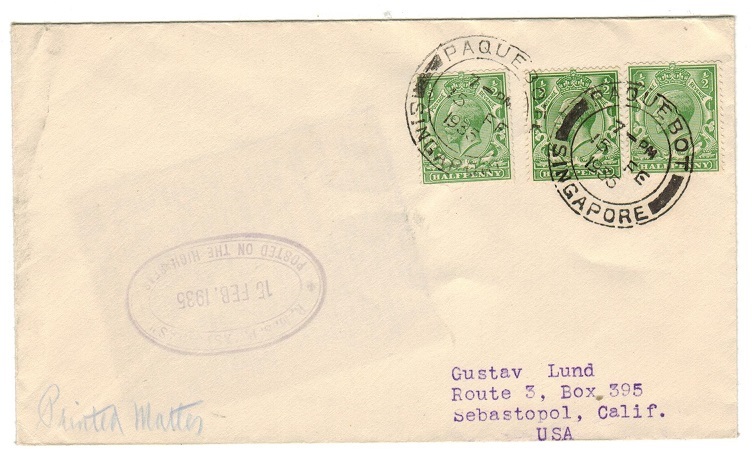 first flight cover addressed to Guam cacheted at lower left with commemorative handstamp. Bears Straits Settlements 5c and 50c adhesives tied SINGAPORE/DON’T WRITE ABOUT SHIPS slogan strike and with violet triangular PASSED FOR TRANSMISSION/94 censor mark. Morenweiser type 6C. SINGAPORE - 1941 censored first flight cover to Manila. 1941 (MY.18.) 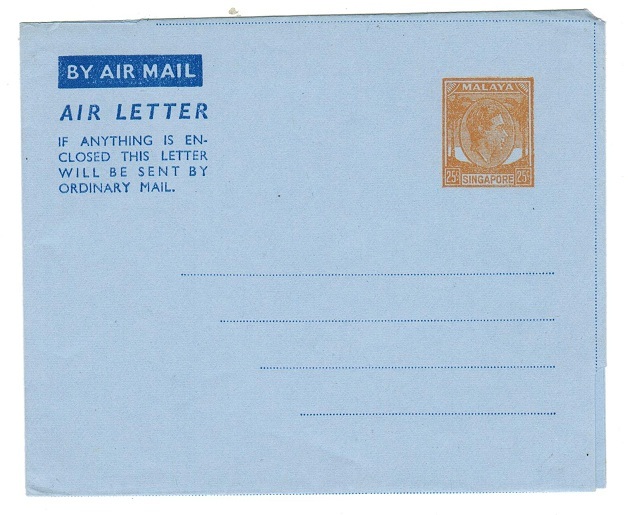 first flight cover addressed to Manila cacheted at lower left with commemorative handstamp. Bears Straits Settlements 30c adhesive tied SINGAPORE/DON’T WRITE ABOUT SHIPS slogan strike and with violet triangular PASSED FOR TRANSMISSION h/s. Morenweiser type 6C. SINGAPORE - 1941 censored first flight cover to Honolulu. 1941 (MY.18.) first flight cover addressed to Honolulu cacheted at lower left with commemorative handstamp. Bears Straits Settlements 5c and $1 adhesives tied SINGAPORE/DON’T WRITE ABOUT SHIPS slogan strike and with violet triangular PASSED FOR TRANSMISSION/95 censor mark. Morenweiser type 6C. SINGAPORE - 1929 12c rate cover to USA used at RAFFLES HOTEL. 1929 (JL.8.) 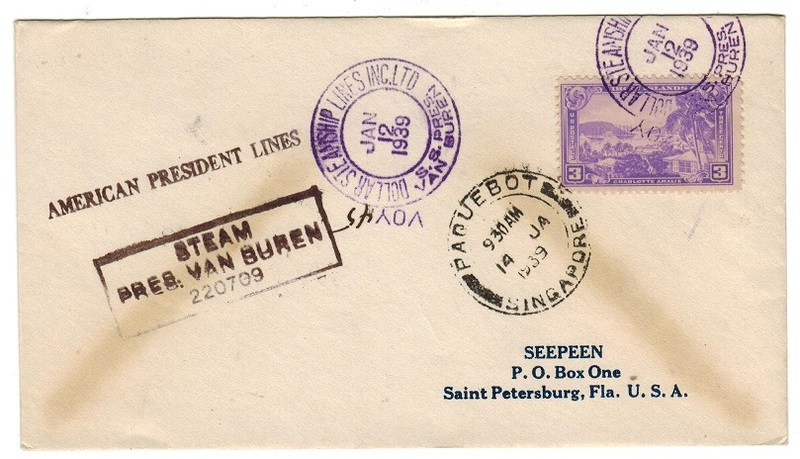 cover addressed to USA bearing 12c blue adhesive of Straits Settlements tied by RAFFLES HOTEL/SINGAPORE cds with additional strike at left. SINGAPORE - 1861 Stampless outer wrapper rated '18' to France cancelled SINGAPORE. 1861 (MAY.8.) use of stampless outer wrapper addressed to France rated '18' with black handstamp and cancelled by black d/r SINGAPORE/P.O. cancel (Proud type D2). PARIS arrival b/s. 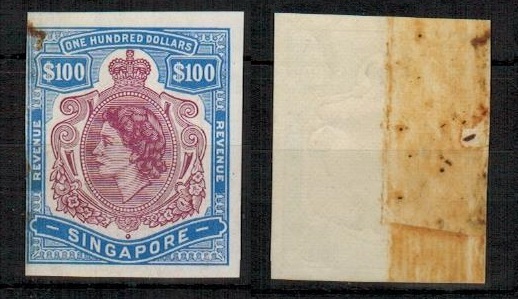 SINGAPORE - 1912 underpaid tax cover (faults) to UK. 1912 (MR.9.) 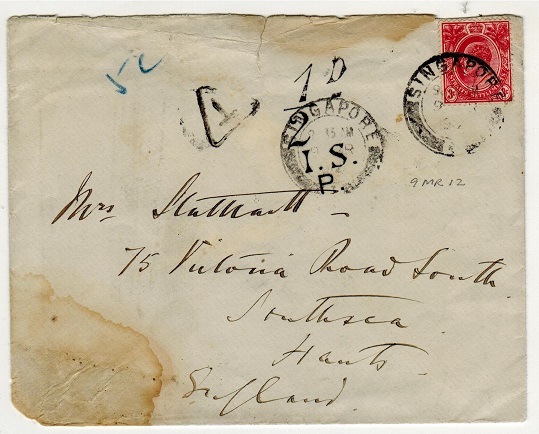 cover addressed to UK (flap missing and small stain and tear) bearing Straits Settlements 3c adhesive tied SINGAPORE but being underpaid having triangular 'T' tax mark applied and with '1/2d' h/s applied with 'I.S./P.' mark. SINGAPORE - 1952 incoming underpaid cover with 10c added on reverse as postage due. 1952 incoming unstamped cover from UK struck on front by black boxed 1/2d/TO PAY/POSTED/ UNPAID instructional handstamp with Singapore 10c added on arrival to back flap and struck by SINGAPORE s/r cds dated 19.DE.1952. This stamp being used as a 'Postage Due'. 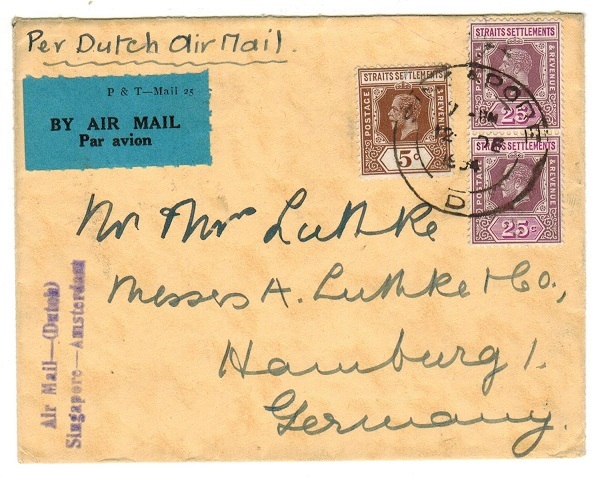 SINGAPORE - 1934 'AIR MAIL-DUTCH/SINGAPORE-AMSTERDAM' cacheted cover to Germany. 1934 (DE.12.) cover addressed to Germany bearing 5c and 25c (x2) on front and additional 2c on reverse tied SINGAPORE/D cds. 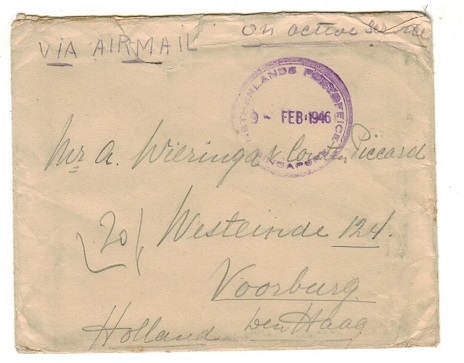 The cover is marked 'Per Dutch Air Mail' and is hanstamped by violet two lined AIR MAIL-(Dutch)/SINGAPORE-AMSTERDAM strike. 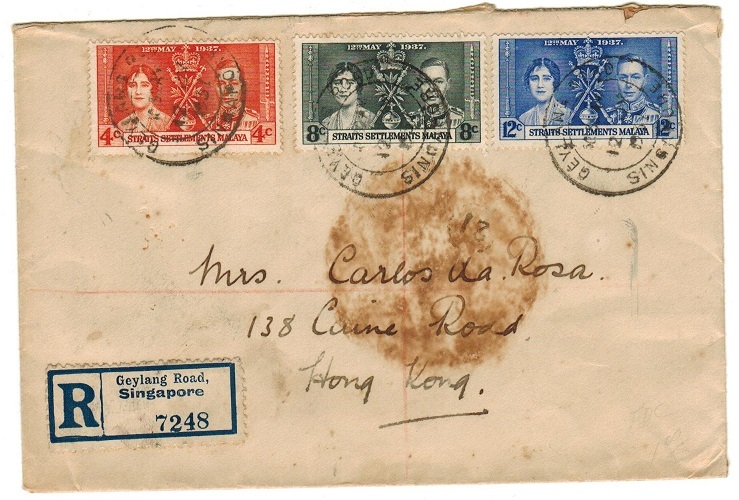 SINGAPORE - 1937 Coronation set on registered cover from GEYLANG ROAD/SINGAPORE. 1937 (JY.12) registered cover to Hong Kong bearing Straits Setlements 1937 Coronation trio (SG 275-77) tied by GEYLANG ROAD/SINGAPORE cds. Blue on white GEYLANG SINGAPORE registered etiquette at left. Large brown tone mark on front. 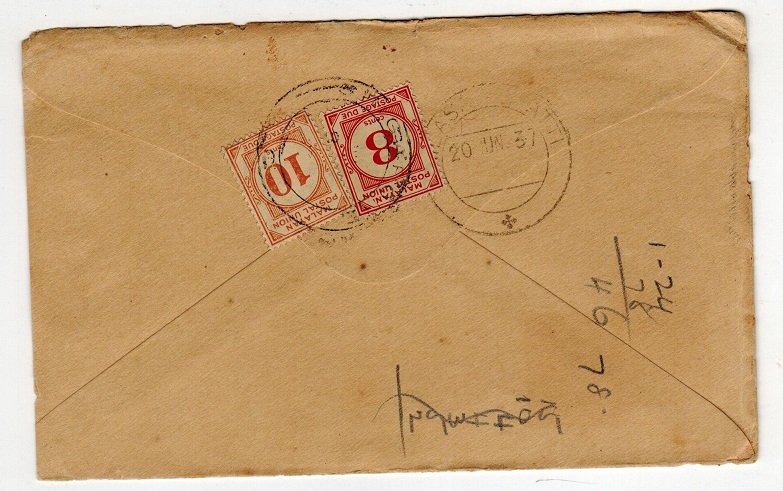 '21' circled Hong Kong postmans mark. 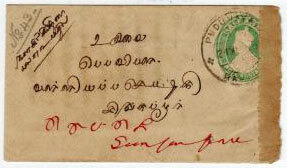 SINGAPORE - 1937 2c green PSC uprated and censored to India. H&G 36. 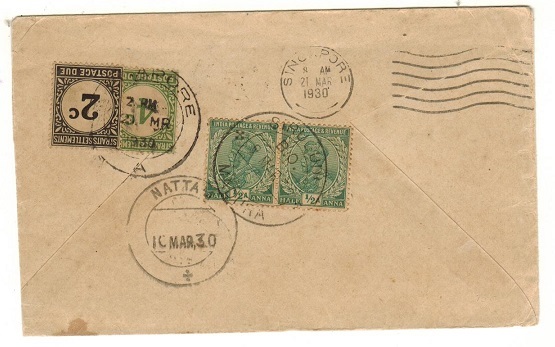 1937 2c green on buff postal stationery postcard of Straits Settlements addressed to India and bearing additional 2c green tied by SINGAPORE cds dated 29.SE.39 with violet boxed PASSED/39/CENSOR h/s at left. Mildly overall toned but a scarce early use. H&G 36. SINGAPORE - 1948 '004' red meter mark cover from SINGAPORE to Holland. 1948 (26.V.) stampless cover addressed to Holland cancelled by red MALAYA/004 CENTS/u.60 - SINGAPORE meter cancel. SINGAPORE - 1936 4c postage due cover used at SINGAPORE. 1936 (MR.9.) 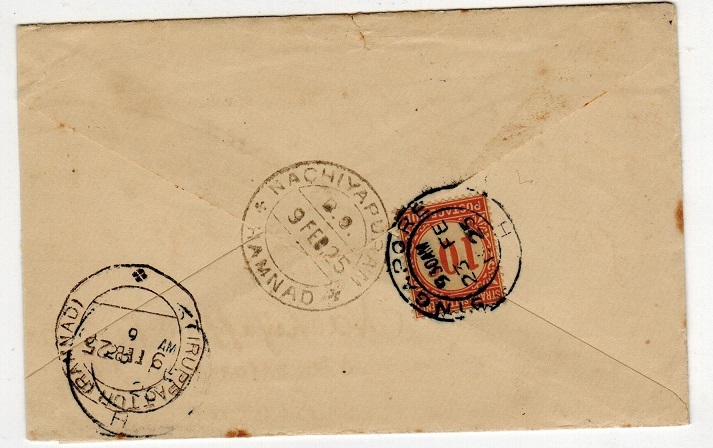 inward underpaid cover from India struck by circular 10/T /C tax mark and with Straits Settlements 4c green 'Postage Due' (SG D3) applied on arrival cancelled by SINGAPORE/J cds. SINGAPORE - 1935 OHMS cover to Penang with PAID/SINGAPORE cancel in red. 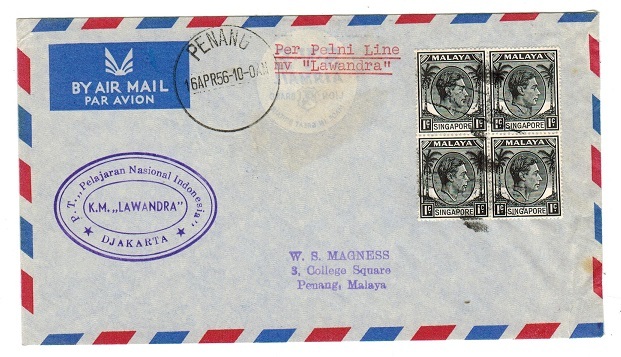 1935 use of small sized OHMS stampless cover to Penang struck at left by oval H.O. RAF FAR EAST/ SINGAPORE cachet and struck by part OFFICIAL PAID/SINGAPORE cds dated 30.JUL.35 in red. SINGAPORE - 1935 inward FIRST FLIGHT cover from Philippines via 'Flying Boat'. 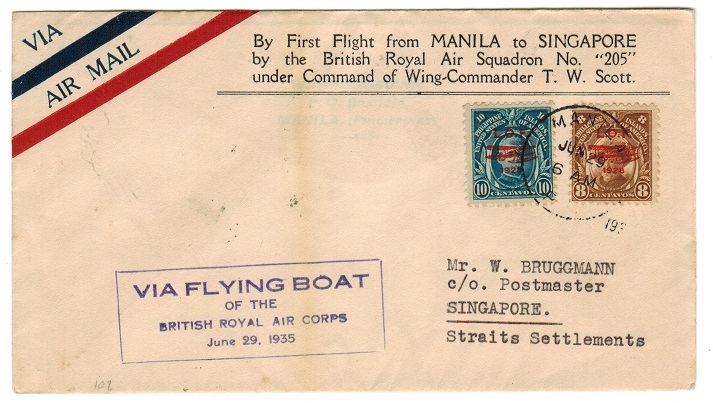 1935 pre-printed 'By First Flight From Manila to Singapore' cover addressed to Singapore and bearing Philippine 8c and 10c 'L.O.F.' overprints tied by MANILA cds with violet boxed VIA FLYING BOAT/OF THE/BRITISH ROYAL AIR CORPS/JUNE 29, 1935 h/s. SINGAPORE/F arrival b/s. SINGAPORE - 1899 4c on 8c surcharge pair used on cover to China. 1899 (MY.25.) 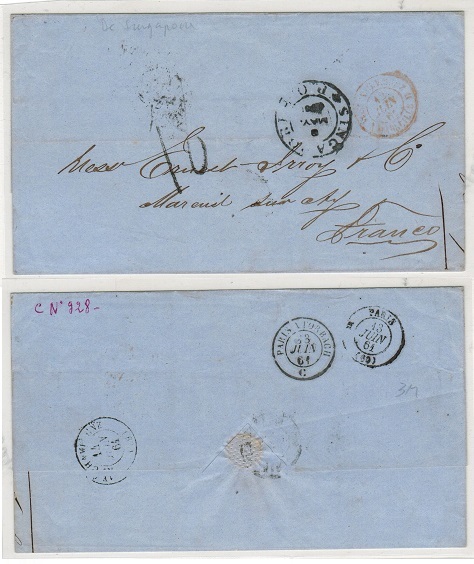 cover addressed to China bearing Straits Settlements 4c on 8c blue surcharge pair (SG 108) tied by SINGAPORE cds with 'E' coding and with red 'Stamped' marked in manuscript below. 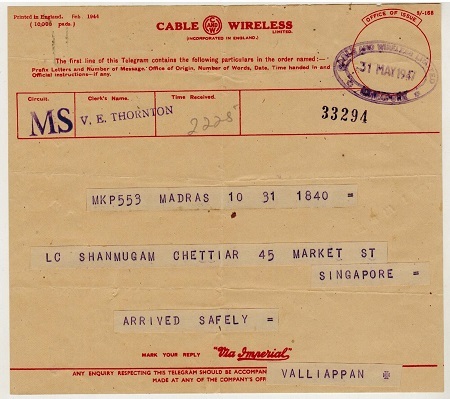 SINGAPORE - 1953 use of CABLE AND WIRELESS telegram with original envelope. 1953 (NO.25.) red on cream 'Cable and Wireless Limited' telegram form cancelled by violet CABLE AND WIRELESS/SINGAPORE cancel and complete with the original blue on cream TELEGRAM envelope although the latter has suffered some worm holes. (2 items). SINGAPORE - 1937 first flight cover to Penang. 1937 (JY.28.) 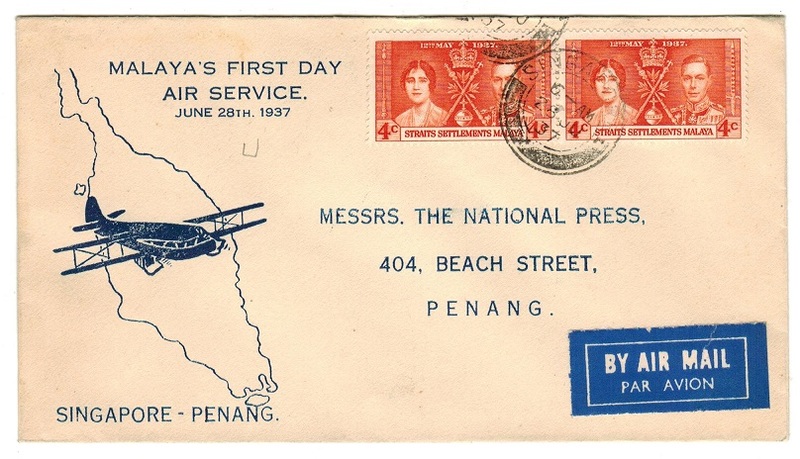 illustrated 'MALAYA'S FIRST DAY/AIR SERVICE' first flight cover addressed to Penang bearing Straits Settlements 4c orange 'Coronation' pair tied SINGAPORE. SINGAPORE - 1895 8c rate (distressed) cover to Rangoon. 1895 (JU.20.) 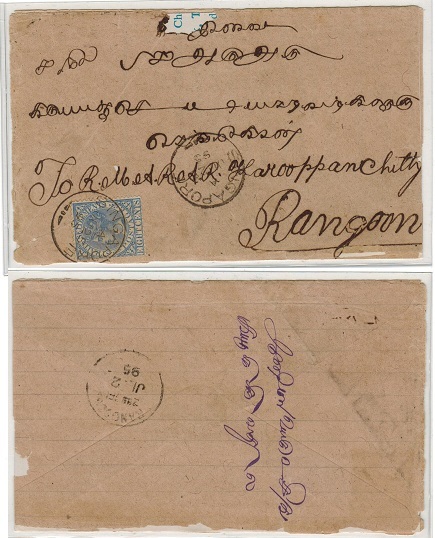 distressed cover addressed to Rangoon in Burma (opened on three sides and with back re-inforced with card) bearing 8c adhesive tied SINGAPORE and with RANGOON arrival b/s. 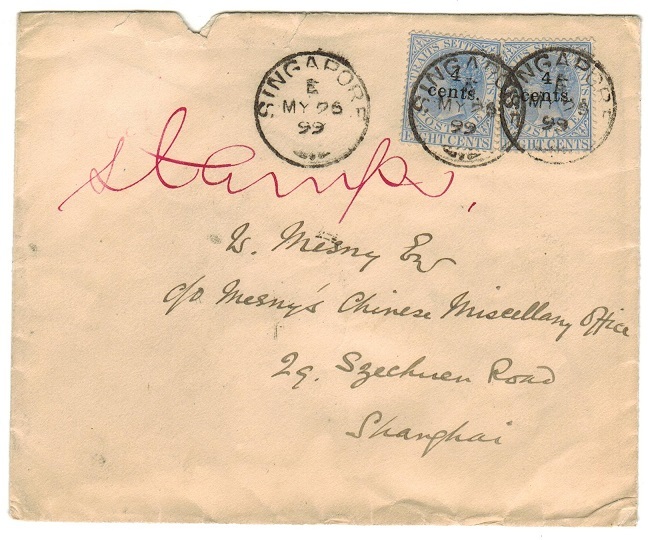 SINGAPORE - 1916 inward cover from India with STRAITS SETTLEMENTS censor label applied. 1916 (AU.2.) 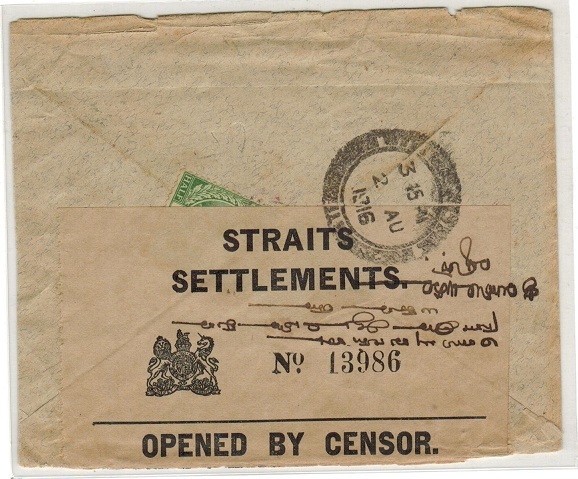 inward cover from India bearing scarce black on cream crested STRAITS SETTLEMENTS/ OPENED BY CENSOR label applied and cancelled by SINGPAORE cds. SINGAPORE - 1894 THREE CENTS on 32c adhesive on cover to Kuala Lumpur. 1894 (SP.11.) 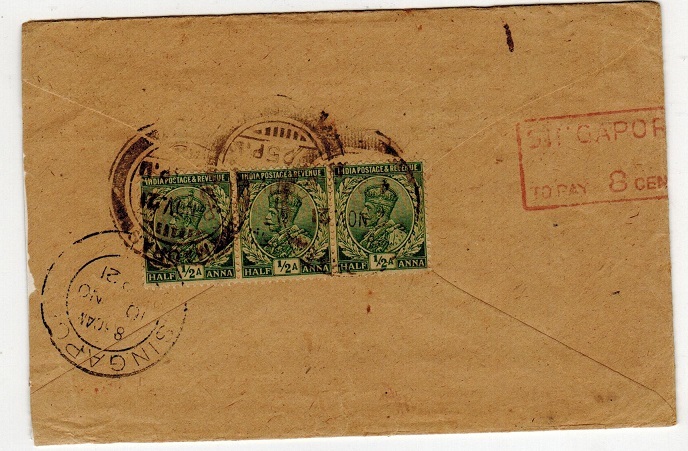 cover addressed to Kuala Lumpur bearing THREE CENTS on 32c red adhesive (SG 94) tied by s/r SINGAPORE cds with KLANG transit at right and KWALA LUMPUR (spelling) arrival b/s. (Proud type 3). 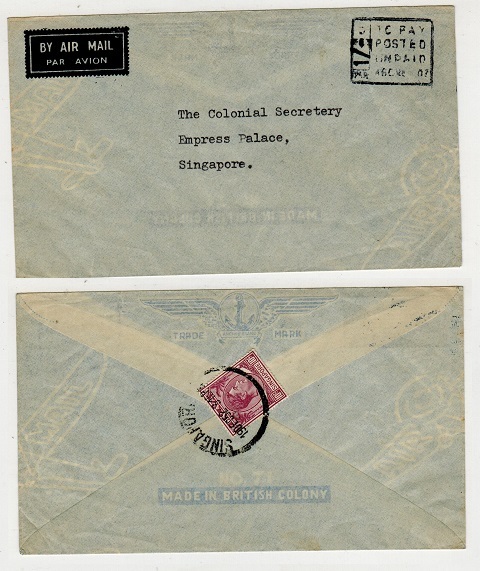 SINGAPORE - 1940 inward censor cover from Kelantan in Malaya. 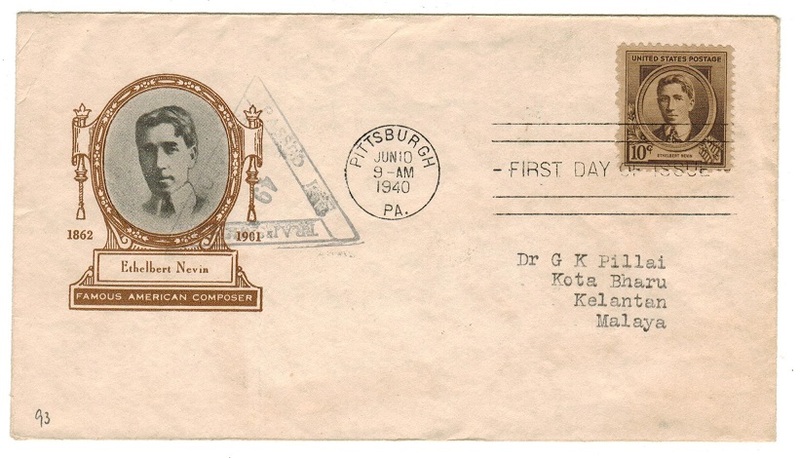 1940 inward cover from USA addressed to Kelantan with KOTA BHARU/KELANTAN arrival b/s dated 20.JUL.40 with black triangular PASSED FOR/TRANSMISISON/49/ SINGAPORE censor marking on front. 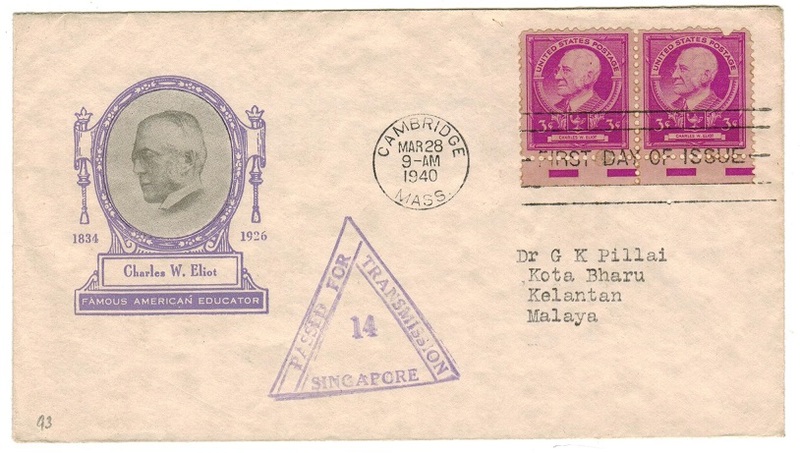 1940 inward cover from USA addressed to Kelantan receiving a fine violet triangular PASSED FOR/TRANSMISSION/14/SINGAPORE censor h/s on front. SINGAPORE - 1945 stampless 'Forces' use at NETHERLANDS POST OFFICE. 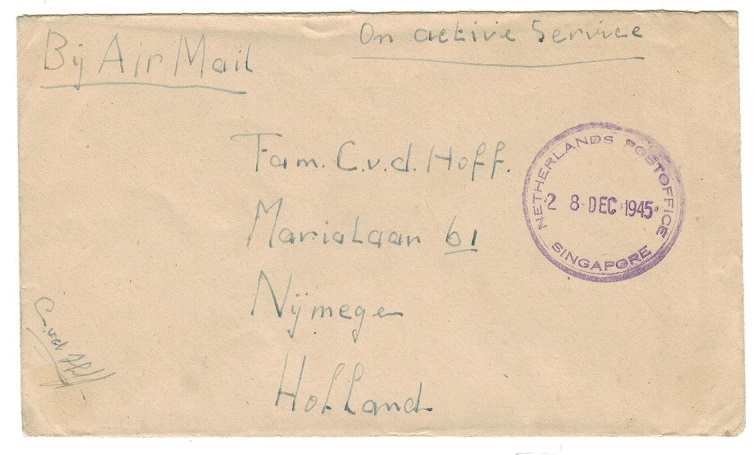 1945 (De.28) Stampless cover to Holland marked in manuscript 'On Active Service' & cancelled by scarce NETHERLANDS POST OFFICE-SINGAPORE cds in violet. 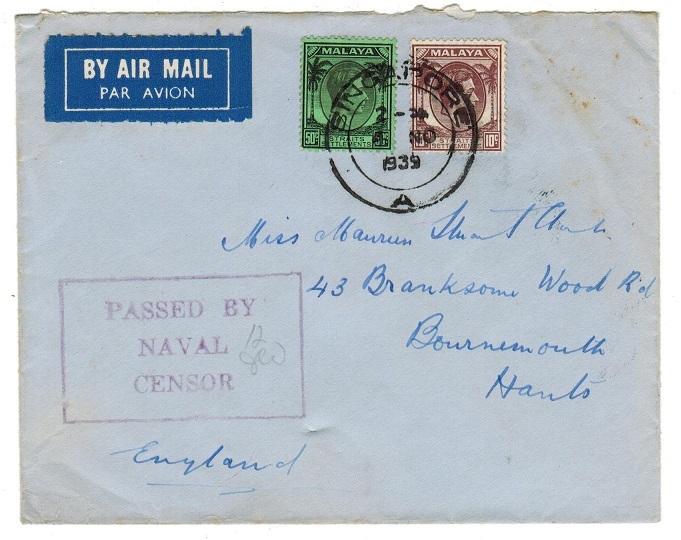 SINGAPORE - 1939 PASSED BY NAVAL CENSOR cover to UK. 1939 (NO.4) cover to UK bearing Straits Settlements 10c & 50c adhesives tied by SINGAPORE/A cds with violet boxed PASSED BY/NAVAL/CENSOR h/s at lower left. An early censored item. SINGAPORE - 1907 inward cover from India with black '8' charge marking. 1907 inward stampless cover from India with SINGAPORE arrival b/s dated AU.26.1907 and struck with black '8' charge marking (Proud type UP34). SINGAPORE - 1910 inward 1/2a Indian PSE with black '4' charge mark. 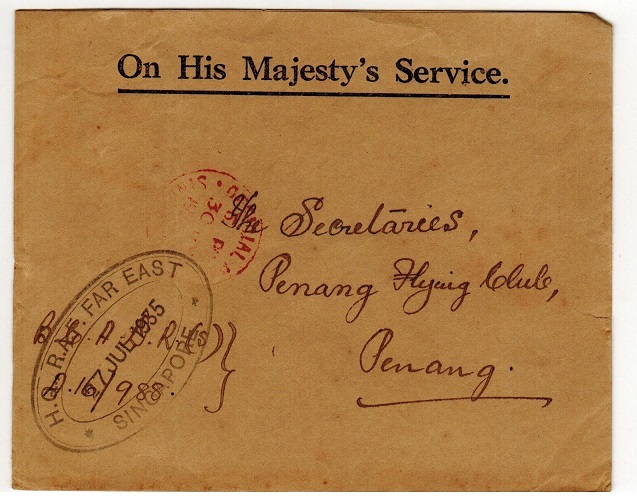 1910 use of Indian 1/2a postal stationery envelope addressed to Singapore being underpaid and having 'T' tax mark on front with SINGAPORE arrival b/s dated 26.NO.1910 with scarce '4' charge strike in black. (Proud type UP31). 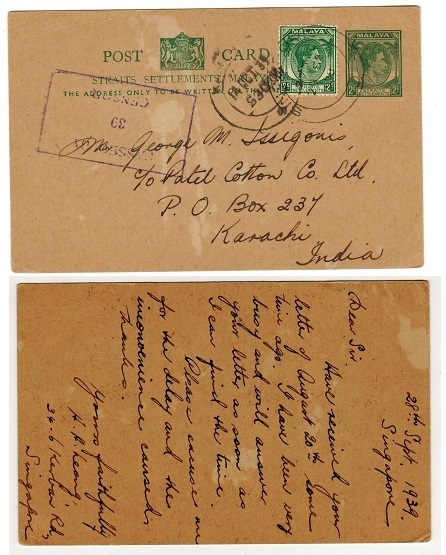 SINGAPORE - 1917 inward censored cover from India. 1917 inward cover from India with black on cream crested STRAITS SETTLEMENTS/OPENED BY CENSOR label applied at right and tied to reverse by d/r SINGAPORE/1 cds dated 2.MY.1917. 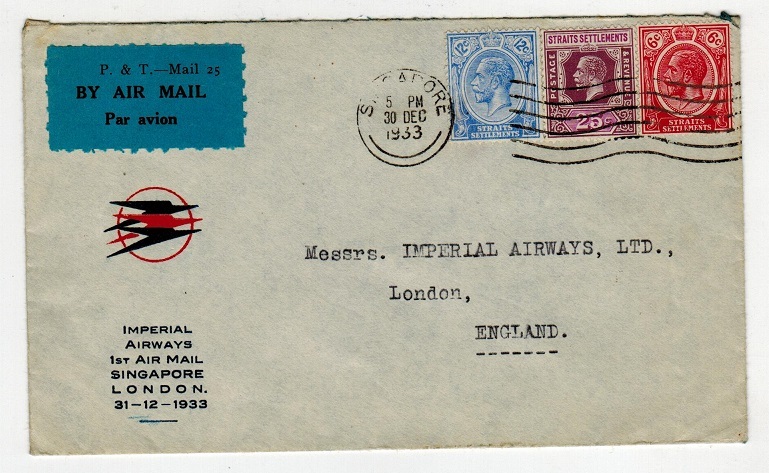 SINGAPORE - 1933 Imperial Airways first flight cover to UK. 1933 (DEC.30) illustrated 'Imperial Airways' first flight cover to UK bearing Straits Settle- ments 6c, 12c & 25c adhesives tied by SINGAPORE wavy line cancel. 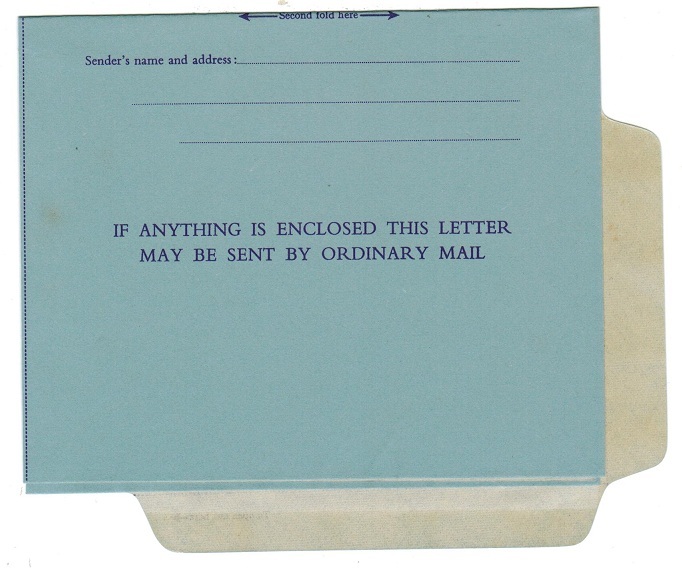 Black on blue 'P&T- Mail 25/By Air Mail' label at left. 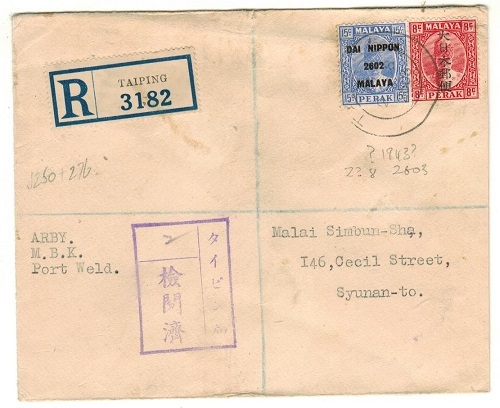 SINGAPORE - 1937 inward underpaid cover with 8c and 10c 'Postage Dues' added. 1937 inward stampless cover from India with circular 'T/50c' tax marking with Union 8c & 10c Postage Dues' added (SG D3+4) tied by d/r SINGAPORE cds. 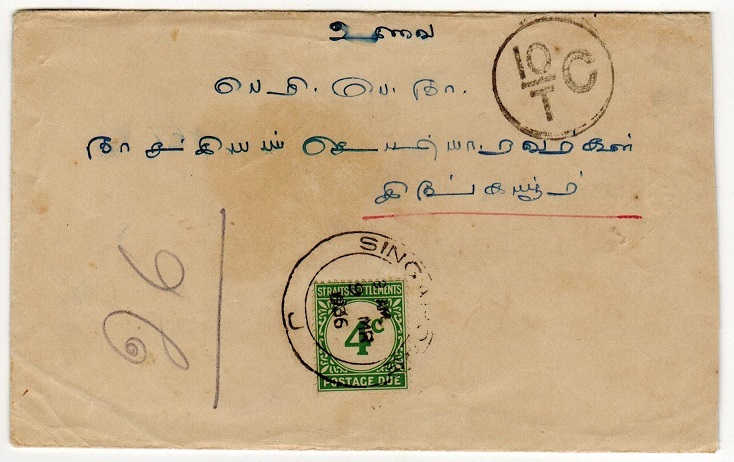 SINGAPORE - 1925 inward underpaid cover from India with 10c 'Postage Due' added. 1925 (FE.23.) 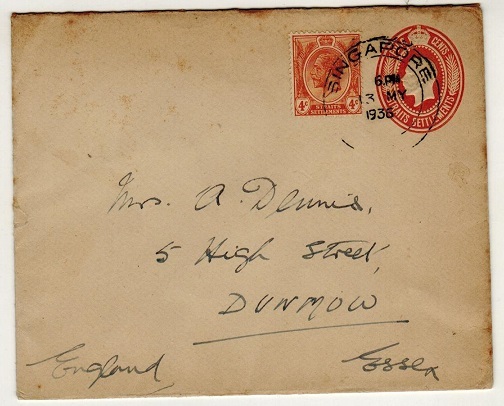 inward unstamped cover from India struck by 'T' tax mark and with Straits Settlements 10c orange 'Postage Due' adhesive (SG D5) tied by SINGAPORE/H cds. 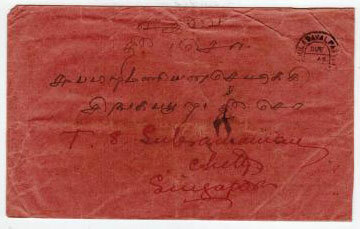 SINGAPORE - 1921 inward underpaid cover from India with red SINGAPORE/TO PAY 8 CENTS h/s. 1921 inward underpaid cover from India struck on reverse side by red boxed SINGAPORE/TO PAY 8 CENTS handstamp. (Proud type UP41). 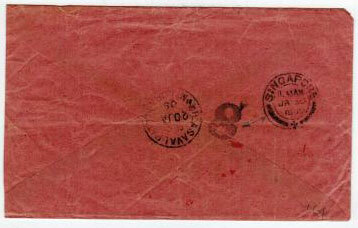 SINGAPORE - 1921 inward underpaid cover from India with red SINGAPORE/TO PAY 4 CENTS h/s. 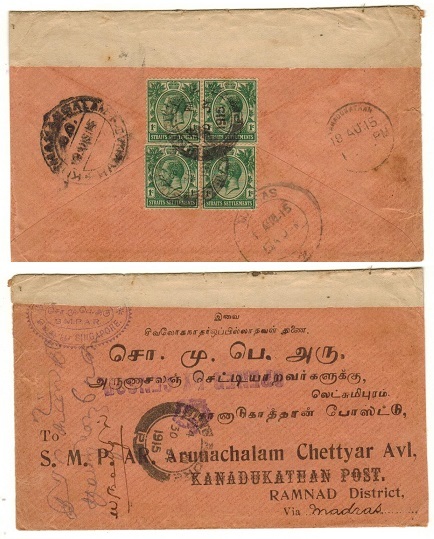 1921 inward underpaid cover from India with SINGAPORE/H arrival b/s dated 19.AU.1921 and struck by scarce red boxed SINGAPORE/TO PAY 4 CENTS instructional strike. (Proud type UP41). SINGAPORE - 1950 (circa) 4c+2c PSC unused. H&G 5. 1950 (circa) 4c brown + 2c red (post paid) handstamp on brownish buff postal stationery postcard in unused condition. H&G 5. 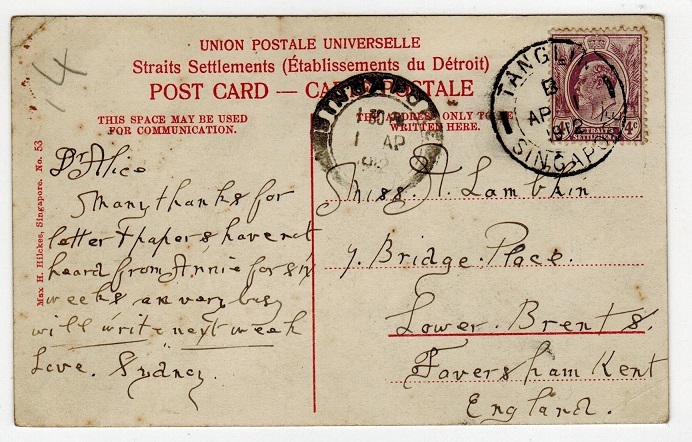 SINGAPORE - 1912 4c rate postcard to UK used at TANGLIN. 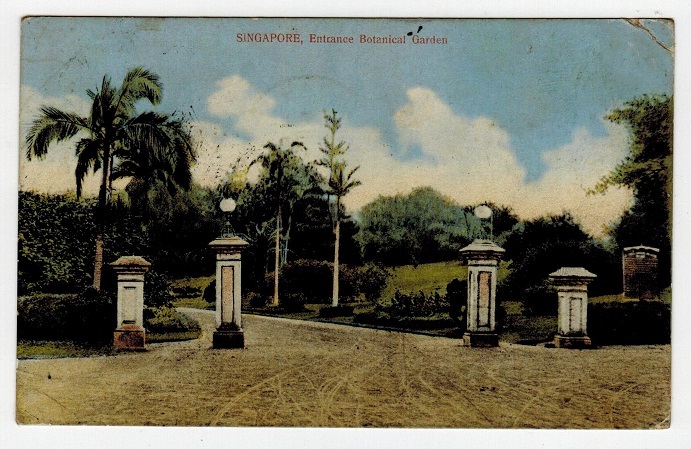 1912 (AP.1) use of picture postcard to UK depicting 'Entrance to Botanical Garden, Singapore' bearing Straits 4c adhesive tied by TANGLIN/SINGAPORE cds. SINGAPORE - 1951 CITY OF OTTAWA maritime PAQUEBOT/SINGAPORE cover to USA. 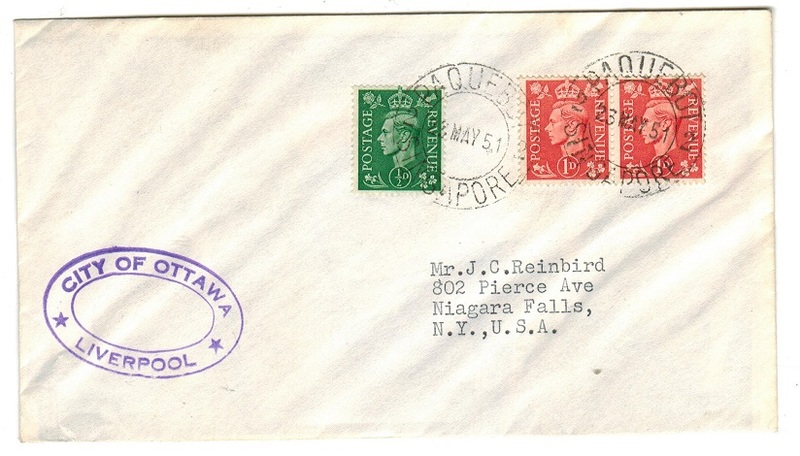 1951 (My.22) cover to USA bearing GB 1/2d and 1d pair tied SINGAPORE PAQUEBOT with violet oval CITY OF OTTAWA/LIVERPOOL SHIP maritime cachet at left. SINGAPORE - 1939 PAQUEBOT/SINGAPORE cover addressed to USA. 1939 (JAN.12.) 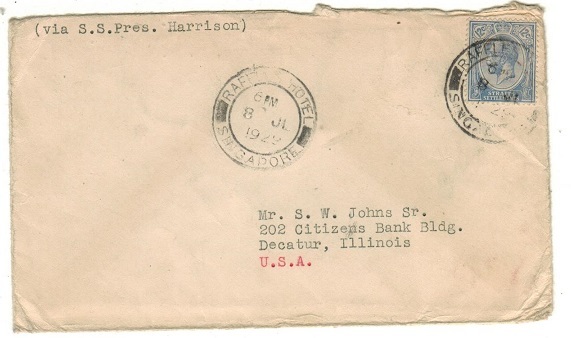 cover addressed to USA bearing US 3c adhesive tied by violet DOLLAR STEAMSHIP LINES INC LTD/S.S.PRES/VAN BUREN cds's with PAQUEBOT/SINGAPORE cds applied below two days later. Black AMERICAN PRESIDENT LINES h/s at left and boxed STEAM/PRES VAN BUREN maritime h/s. SINGAPORE - 1935 PAQUEBOT/SINGAPORE cover addressed to USA bearing 'GB' adhesives. 1935 (FE.15.) cover addressed to USA bearing 'GB' 1/2d (x3) tied by PAQUEBOT/SINGAPORE cds and with violet oval R.M.S.P./POSTED ON THE HIGH SEAS maritime h/s below. 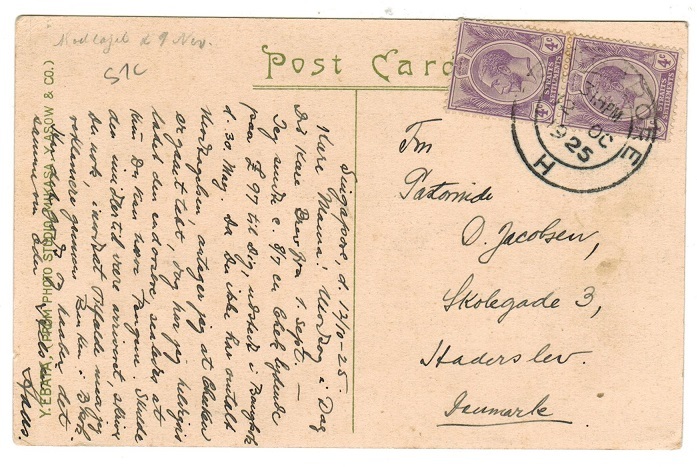 SINGAPORE - 1925 postcard to Denmark with 4c pair tied SINGAPORE/H. 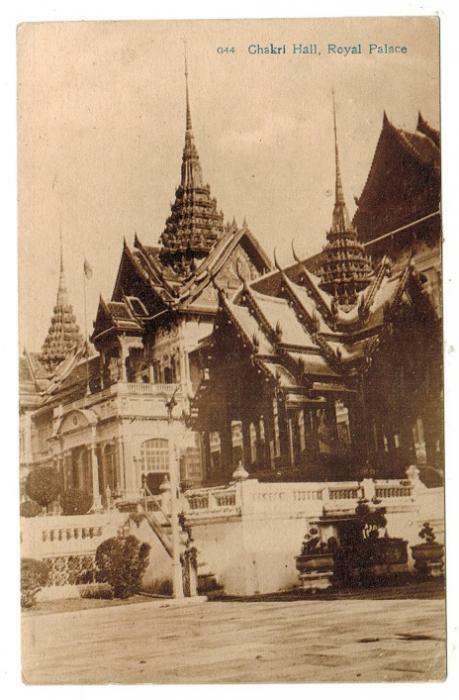 1925 (OC.12) use of picture postcard addressed to Denmark depicting 'Ghakri Hall, Royal Palace' bearing Straits Settlements 4c violet pair tied by SINGAPORE/H cds. SINGAPORE - 1956 K.M.LAWANDRA maritime cover to Penang. 1956 (APR.16) cover to Penang bearing 1c black 'KGVI' Singapore adhesives in a block of four tied by two boxed PAQUEBOT h/s's with violet oval K.M.LAWANDRA maritime cachet at left and PENANG arrival on front. SINGAPORE - 1934 first flight cover to Australia. 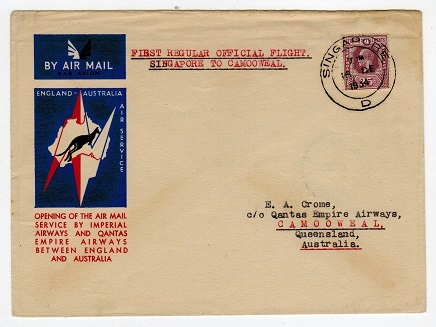 1934 (DE.16) Illustrated first flight cover to Australia on the Imperial Airways England to Australia flight bearing Straits 25c tied by d/r SINGAPORE/D cds. SINGAPORE - 1949 4c+4c brown PSRC unused. H&G 2. 1949 4c+4c brown on brownish buff "KGVI" postal stationery reply type postcard in fine unused condition. H&G 2. 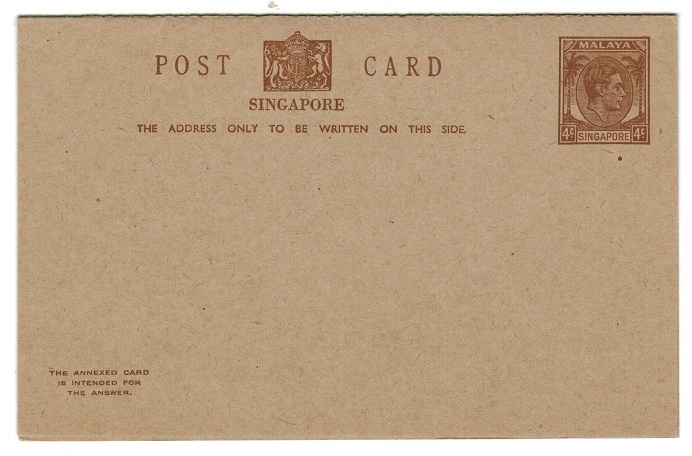 SINGAPORE - 1951 25c postal stationery airletter unused. H&G 1. 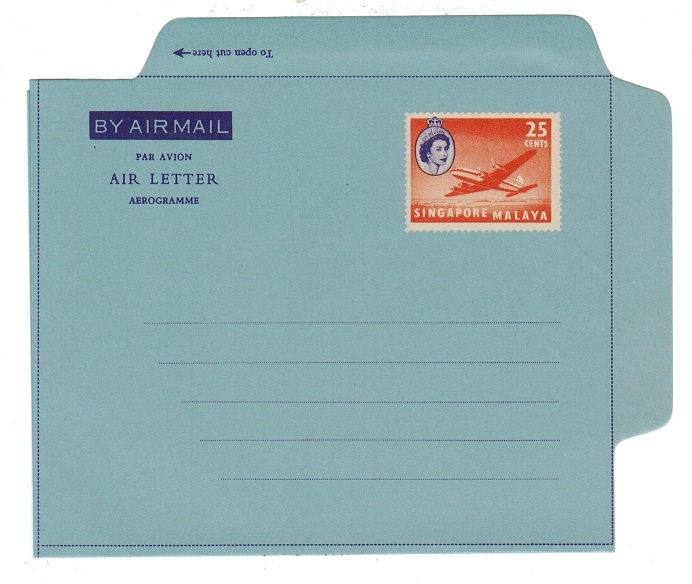 1951 25c deep yellow on light blue postal stationery air letter of 'KGVI' in fine unused condition. H&G1. SINGAPORE - 1971 15c (SG 146) IMPERFORATE PROGRESSIVE PROOF pair. 1971 15c (SG146) IMPERFORATE PROGRESSIVE PROOF pair in blue of the Country names forming a circle printed on white gummed paper & overprinted SPECIMEN in black. Ex printers sample sheet & noted by SG in footnote. Scarce. 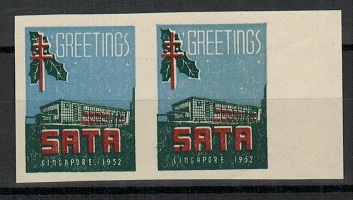 SINGAPORE - 1952 SATA-TB greetings label IMPERFORATE PLATE PROOF pair. 1952 IMPERFORATE PLATE PROOF of the 'SATA - TB Greetings' label printed in the issued colours of red, green and blue on cream ungummed paper. Scarce item. SINGAPORE - 1956 25c PS air letter unused. H&G 7. 1956 25c orange and violet on blue postal stationery air letter with two lined instruction on reverse in fine unused condition. H&G 7. SINGAPORE - 1971 15c and 30c IMPERFORATE PROGRESSIVE PROOF pair overprinted SPECIMEN. 1971 15c & 30c (SG146+147) IMPERFORATE PROGRESSIVE PROOF - SE TENANT pair showing both the 'Country names forming circle' & 'Flags in Circle' printed on white gummed paper & each ovpt'd SPECIMEN in black. A scarce formation. Ex printers sample sheet & noted by SG in footnote. SINGAPORE - 1926 TANGLIN to Kuala Lumpur first flight cover. Only 5 covers reported sent. 1926 (AU.21.) first flight cover addressed to Kuala Lumpur bearing Straits Settlements 1c pair and 2c adhesives tied by TANGLIN/SINGAPORE cds's held until the August 23rd first flight with fine KUALA LUMPUR arrival b/s of that day. This being the first stage of the Singapore to Port Swetenham flight of which only 5 covers were flown. (Muller 1). 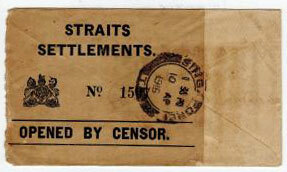 SINGAPORE - 1916 WWI cover with STRAITS SETTLEMENTS/OPENED BY CENSOR label. SINGAPORE - 1916 inward Indian 1/2a green postal stationery envelope bearing crested STRAITS/ SETTLEMENTS/OPENED BY CENSOR label on reverse tied by SINGAPORE arrival cds dated 10.AP.1916. A scarce WWI censor cover. 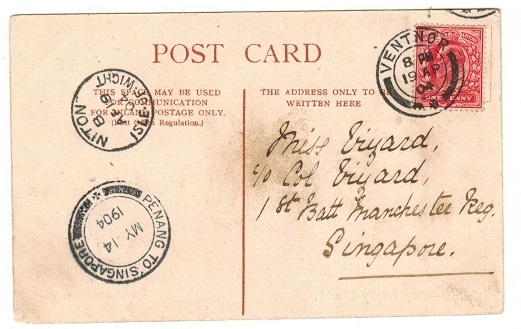 SINGAPORE - 1909 inward cover with '8' UNPAID h/s applied. 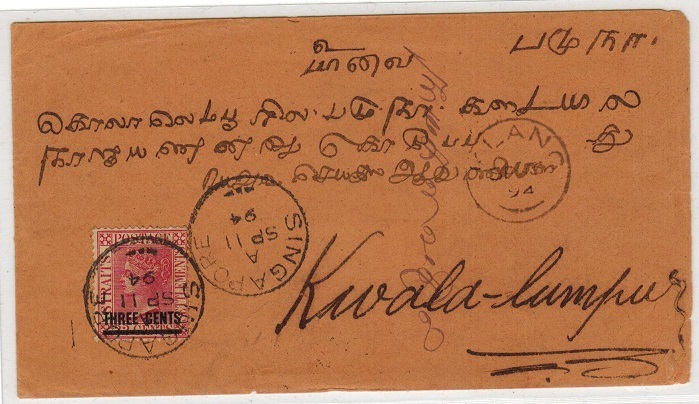 1909 inward underpaid cover from India struck by SINGAPORE arrival cds dated JA.30.1909 with a fine strike of the scarce '8' unpaid handstamp in black. (Proud type UP34).